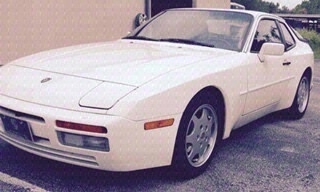 1989 Porsche 944 S2. This is a pristine example of these wonderful cars. Only 49K miles! Interior and exterior absolutely excellent. The color is the right too, white with dark blue interior and leather seats. Everything works and no cracks in the dash or door sills. New tires. New ceramic brake pads. New rotors still bright silver color and the water pump and belts have been changed. It is getting harder to find these cars in this condition. This is a keeper. A car that turns heads and one that you can be proud to drive to a Porsche Club event and park next to those newer 911’s. The 944 S2 has a 3 liter, naturally aspirated four cylinder engine that produces 208 hp.. The Turbo barely beats the S2 at 217 HP, but the 944 S2 has fewer problems than the turbos whose 2.5 liter engines are highly stressed under boost. It makes the 944 S2 the much more desirable model of vehicle in the 944 family. Want more hp? No problem. These engines are easy to chip. The car is tight. No rattles and of course you immediately feel that 49/51% balance in the cars design as you maneuver turns. Comes with original manuals, spare tire and tools and it even has the original window sticker. Comes with an upgraded Alpine radio and CD player with remote control, bringing your listening to tunes up to modern standards. Won’t last long. This is one you have to see if you have ever thought about buying a collectable 944.